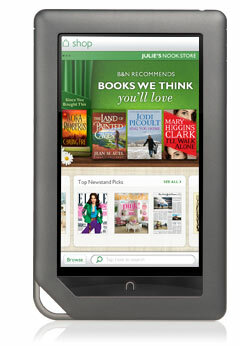 The Nook Color is out and Barnes + Noble wants me to sell it for them. Their image on the ad is for crap, but that is all they have. Weird. They are the weekly sponsor on the sidebar, hit 'em up, yo. Buy one of them bad boys. FOR. THE. CHILDREN. OR. YOUR. MOTHER. I saw a CNet video where they say it's actually an ereader-focued Android tablet. Runs apps and can access Android Market and everything. Or I'm remembering it that way, whether they actually said that or not. This Nooky thing might be great. I have a couple of friends that are all over this Nook. They actually believe that it will do everything any other tablet will do and have a great screen while doing it, too. I'm looking forward to seeing what it can do.